The economic and social costs of the opioid epidemic have many looking for ways to end the loss of life that is devastating families across the globe. BALTIMORE — The economic and social costs of the opioid epidemic have many looking for ways to end the loss of life that is devastating families across the globe. Some of the best minds at the state’s top research institutions believe part of the solution may be rooted in understanding the problem. "We have treated it as a criminal justice issue. It’s a health problem, it’s a chronic, reoccurring problem when you have addiction. So one of the things we haven’t done is we haven’t said that enough," said Dr. Richard Barth, the Social Work Dean at the University of Maryland Baltimore. "If you’ve worked in the field of substance use disorder for a while, you know that it’s very difficult to treat people once they become addicted to a drug, and there’s a lot of effort that goes into being able to do that," explained Dr. Kelly Dunn, an associate professor at Johns Hopkins University. That treatment could come in the form of the Comprehensive Addiction Recovery Emergency Act or Care Act, a $100 billion effort proposed by U.S. Congressman Elijah Cummings. If passed into law, it would provide nearly $100 million to Maryland alone to help organizations focused on prevention, treatment, and recovery. But some may wonder why there hasn’t been more of a focus on preventing a person’s addiction instead of treating it after being prescribed the drug. "There was a lot of emphasis for a long time in finding ways to treat opioid abuse disorder or drug use disorder once it developed. There’s been less I guess interests, understanding of the value of investigating these things," said Dr. Kelly Dunn. But obviously it’s no secret, for decades doctors have known opioids may be addictive. 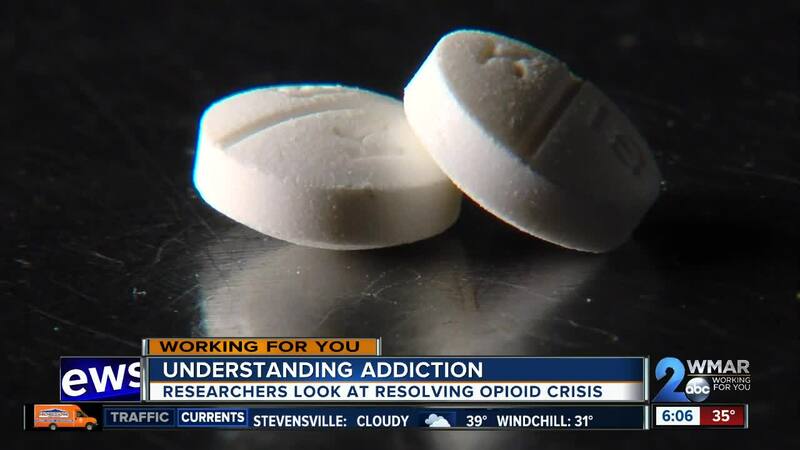 "I think we thought we were brighter than we were, back then, there was a feeling that if you gave opioids in the clinic to treat pain that the majority of patients didn’t become dependent, " added on Dr. Andrew Coop, a professor at the University of Maryland Baltimore. Several states have filed lawsuits against pharmaceutical companies, blaming them for misleading doctors about the dangers of the drug. Maryland Attorney General Brian Frosh is investigating the pharmaceutical company Insys for allegedly using doctors, pharmacists, and sales reps to increase market share at the expense of patients. Researchers also are fighting back against the opioid crisis, not in court but on campus. At Johns Hopkins medicine, Dr. Kelly Dunn is leading research that asks the question, what if you could predict addiction? "We were looking at this as spectrum of how to help people in thinking that if we could reduce the likelihood that they would become addicted to begin with, then perhaps we could reduce the burden on the health care industry in terms of trying to treat people who have become addicted," said Dr. Dunn. And at the University of Maryland Baltimore, Dean of the School of Social Work, Dr. Richard Barth, says they’re taking an all hands on deck approach that brings together several schools of thought including pharmacy, health, social work, and law to create a joint focus on addiction research. "This is a multi-disciplinary center that includes all of the professional schools here at UMB, and that focuses on those four things, on workforce, on systems of care, on research, and on policy." Meanwhile, some consumer advocates partly blame the Food and Drug Administration for continuing to approve more opioids to be put on the market for doctors and their patients. "Unfortunately, they sort of look too narrowly at just the data where the drugs where tested in clinical trials and don’t think and assess more broadly how their approval actions. If that’s the decision they choose to make, they are going to adversely impact public health," said Dr. Michael Carmone. One approach to the problem includes prescribing or using other medication you may have heard of such as the detox drug Methadone or the overdose antidote Naloxone. On Wednesday, we’ll hear what researchers think about those drugs as part of the path to recovery.